Time for something different in XBOX One shmups, and this time is the "Cat-em' Up" shooter Aqua Kitty UDX. 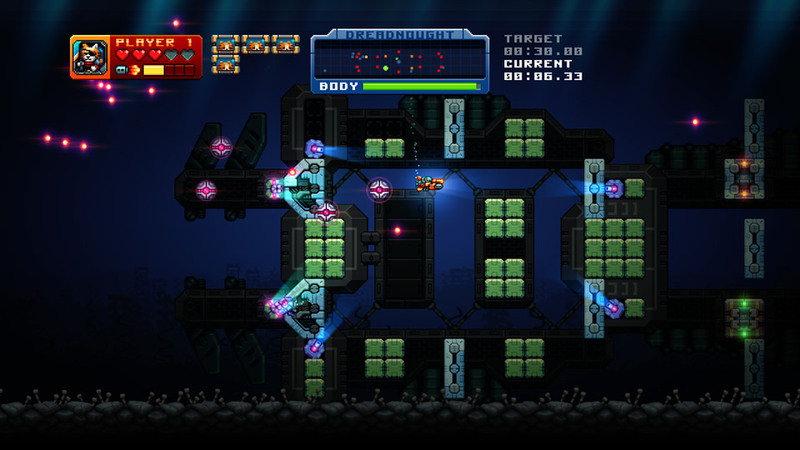 An "Enhanced" port of the PlayStation Mobile shmup Aqua Kitty: Milk Mine Defender and the PS Vita and PS4 Aqua Kitty DX version. The story tells us that cats has taken the seas. The terrifying cause: A global milk drought. There's no more milk on the land, so that means trouble for the kittens until they found a reservoir of fat-free milk underwater. Thus, the cats has taken the world's oceans in order to supply the milk demand. But that comes with risks. Mechanical fishes known as the Paleofish will try to drive the cats out of the water and halting the milk mining operation, so it's up to you and a friend to stop the Paleofish until the cats get their supply in time. The plot may sound like a child wrote it after a school trip visit to a refinery, but the game is more than just kid stuff. The game is splitted in 3 modes: Classic, Arcade and Dreadnought. Classic is the "Main game" where you can replay any level, and you can switch the difficulty, so that means you will have to play all the levels twice to fully complete this mode. Also, the level selection is map-based, pretty much like the Super Nintendo version of U.N. Squadron where you could decide which stage to strike next. Regardless of which mode you're playing, the gameplay is a clone of Defender and the NES sequel Defender II. Thus, Aqua Kitty's gameplay remains on a very simple basis: Save your fellow cats from being captured by the Paleofish. Your only warning of a captured cat will be a meow. Keeping the cats safe is the priority since losing them means failing the level. You can exploit the advantages of being in one "border" and head to the other side since the game's "infinite scroll" loops the stage, helping you to save two or three platforms in a very short time. Keeping kittens safe from harm isn't just about getting extra points, its also part of the game's achievements. Another interesting feature was the inclusion of Chains which works like both Combo Counter and Bonus Multipliers adding a simple but effective Hi-Score rush in order to break the current stage record. But the best part of the game is the weaponry featured in the game. Goldfishy and Silverfishy are the "Item Carriers" of this game. At first you'll think they give you a random item, but to know which item do you want, you'll have to keep an eye on the 'fishys eyes as they change their color, that will determine which item you'll get. TIMED SUPPORT (Blue): Sends two Divers which get in position above and below your ship like the Bits in R-Type. They give you additional firing support for a moderate period of time. Picking another Timed Support item will replenish the time. BOMB (Green): Rather than the traditional pick and use later bomb item like in Raiden and Aero Fighters, the Bomb in Aqua Kitty UDX is a field effect triggered when the player touches it. The Bomb releases multiple missiles creating a considerably long blast radius, damaging and destroying all enemies in its range. HEALTH (Red): This item replenishes one Heart of energy. DIAGONAL (Blue): Fires diagonal shots in both ascending and descending angles, making your standard 1-Way shots into 3-Way shots. VERTICAL (Yellow): The vertical fires bullets up and down in a vertical angle, this is very useful to save captured kittens when the Paleofish are out of the water. Combined with the Diagonal and Rear gives your ship a 6-Way shot (Frontal 5-Way + Back shot). Along with your addtional weapons, you have an extra weapon bundled to your ship: the Turbo Fire, which is your "Heavy Machine Gun" as it combines speed and strength. However, the Turbo Fire's initial energy gauge is too short, which will result in short-lasting attacks. To upgrade it, you have to complete the boss levels. Increasing the Turbo Fire gauge is essential to give you an extra hand on keeping the Chain Bonus increasing. Another feature of the Classic Mode is the Infinite Espresso level where the cat rescue is discarded in favor of an endless wave of enemies. The objective of this game is to survive as long as possible. If you can survive 10 or 20 waves the better since you'll unlock an achievement for surviving. Arcade is more "Full linear" than Classic since the levels can only be played once. One major difference from the Classic mode is that the game replaces the Goldfishy and Silverfishy item dropping enemies in favor of a Gradius / Contra Force style Power-Up system which works by picking a Green Crystal dropped by a special green fish. Unlike Gradius where you could only have Double or Laser, in this game you can have Rearfire, Vertical and Diagonal at the same time, also they can be upgradeable like in Otomedius Excellent. The Turbo Fire can be upgraded via the Crystal system rather than passing a boss battle like in Classic Mode and you can regain Heart points with this Power Up system. Something that i liked is the change on the weapons energy from being temporary to permanent, addressing the issue of the self-consuming energy gauge when the weapons aren't being fired. The bad news is this mode has two issues: First, if you take a hit, all the three upgradeable weapons will power down. Second, if you die in this mode, then it's Game Over and you have to start all the way back to Stage 01. So, if i have to compare it with other shmups, i'll say this is more like the Arrange Mode of games such as Ibara and Triggerheart Exelica. 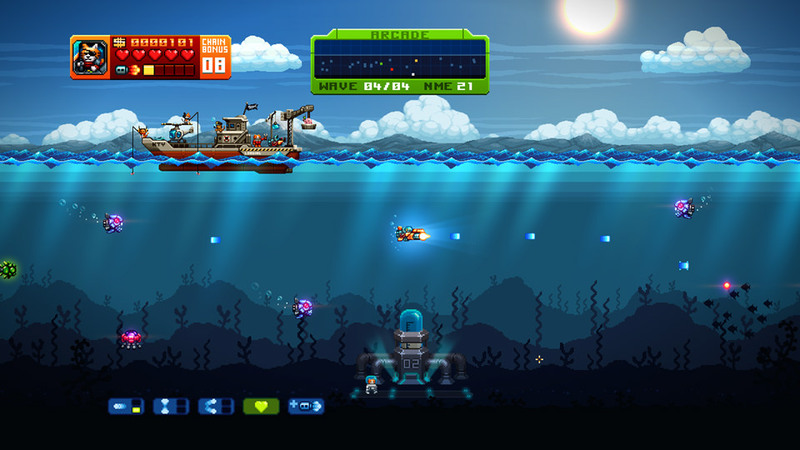 In both modes, there's two ways of losing: The most common is the destruction of your ship after losing all your hearts, the second is if the Jellyfish robots kidnap all your Milk Mine workers, once they're all gone, the level will fail if you're in Classic Mode, or if you're playing in Arcade Mode the game will end, regardless of how much life do you had. Also, once you get a Green Crystal you've better pick it once, because they'll disappear once they hit the ground. Also, in some cases the best chance of staying alive is letting a Jellyfish escape with a captured cat rather than "Try to Play Hero" in an attempt to save him, better to lose a 2,000 point bonus than 1 heart. Dreadnought is the XBOX One and Switch exclusive feature of the UDX version, and it's the only mode that lacks of a selectable difficulty. This is your Time Attack Mode where you have to destroy a large ship in the shortest time possible. However, you have to destroy blocks that compose the ship's body before going all "Shoot The Core" on it. Obviously that means consume more time than the usual, since your "Target" time is quite short for your initial status. However, there's some advantages on your side during this mode. You can rescue captured cats which take a few seconds out of the overall time spent on the level. During your mission, the Goldfishy and Silverfishy enemies from the Classic Mode will appear to support you. To complete your list of advantages, completing a certain number of bosses will increase the gauge of your Turbo Fire, making your sub-shots last longer, becoming more useful in the task of achieving a new record. Keep in mind, you can repeat the missions anytime. 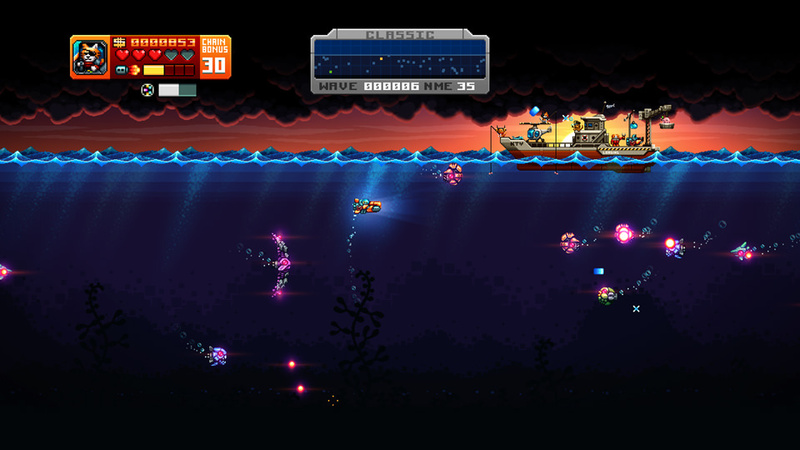 Although Aqua Kitty UDX is a Defender / Defender II clone, the graphics are quite unique, as they resemble the veteran Commodore Amiga computer and its finest classics such as Frenetic, Apidya, Nucleus, Project X Special Edition '93 and Xenon 2 Megablast in the use of very vibrant environment colors, metallic gradient look in the logo and in-game fonts, breaking with the Retro-style's common habit of looking like the NES or the SNES. Any Amiga-enthusiast will think this game is a missing Amiga shmup that saw the light of the day, and it successfully does with its graphics, however they have some modern visual effects like the underwater lighting and the "Bomb" explosions. We can think about this combination of graphics as "Neo-Nostalgic", old Amiga-like graphics with modern visual effects. As for the character design, don't expect Trevor McFur in the Crescent Galaxy, ThunderCats or Swat Kats-like character designs when you hear the word "anthropomorphic cats". Being a game with a kid-friendly plot, your feline forces have a look similiar to the 80's Battle Beasts, Sylvanian Families and some of Marc Brown's Arthur and D.W. books, with a slight hint of StarFox on them. Although your ship is actually a submarine vehicle, its frame design resembles more of a space fighter. One thing to notice is the enemy design, which takes elements from Darius, mostly the use of marine lifeforms, which they feel more like "Extra characters" for the Darius universe rather than this "Cat-em' Up" game. If the graphics are very Amiga-like, the sound is also Commodore-esque. The synthesizer used sounds very reminiscent of the Commodore 64 and Tim and Geoff Follin's works such as Sky Shark and Silver Surfer on the NES (bad games with good music), blended with modern instruments, resulting in a deeper enhancement of the game's "Neo-Nostalgic" ambient. 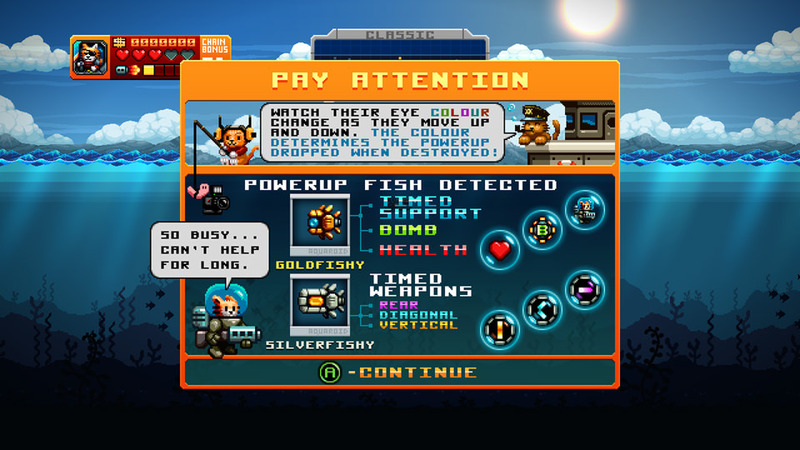 Overall, Aqua Kitty UDX and its previous versions are more than just a Defender clone. They're also a delight for Amiga fans who will feel right at home with this shooter that makes a good throwback to the days of the good ol' Commodore computer. Ready to Shmuppin' again... No Guts No Glory!